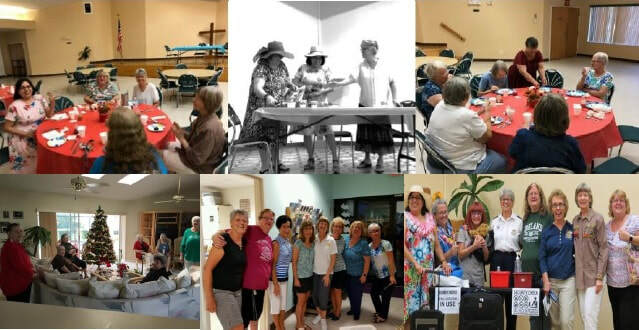 We, are a community of women created in the image of God called to discipleship in Jesus Christ and empowered by the Holy Spirit. We commit ourselves to growth in faith, affirm our gifts, support one another in our callings, engage in ministry and action, and promote healing and wholeness in the church, the society, and the world. What does our logo mean? 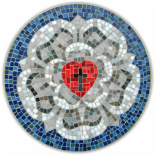 Our logo—with the cross, water and a white lily—identifies women of the Evangelical Lutheran Church in America as children of God; baptized, forgiven, adopted into God's family, full of grace and hope in eternal life. It is a reminder of the growth, beauty, and vitality that rises out of that life-giving baptismal water. It is also a reminder of the mission of the church to "Go, therefore, make disciples of all nations; baptize them in the name of the Father and of the Son and of the Holy Spirit" (Matthew 28:19). ..meetings are held the first Monday of the month in each of the members' homes.